Mutual Funds Vs Share Market – Where to Invest Money? Some people like to play safe and opt for familiar options. Suppose you are in a new restaurant. The menu has exotic dishes, but you still order something familiar just to be sure you don’t regret it later. You may choose a regular ‘Paneer Kathi Roll’ over a ‘Couscous Paneer Salad’ to be safe. But you managed to get an idea about the new restaurant while enjoying its services, ambience and food. 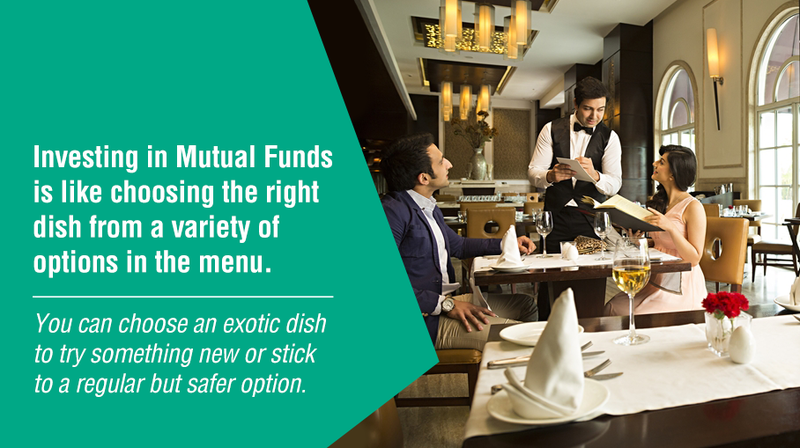 Investing in Mutual Funds is like ordering the right dish on the menu at a restaurant. If you prefer to stay away from the stock market, you can still choose to invest in debt funds for your financial goals. Mutual Funds are broadly categorized into equity, debt and hybrid, Solution Oriented Schemes and Other Schemes based on where they invest. If you don’t want to invest in stocks via equity mutual funds, you can still experience the benefits of investing in mutual funds through debt funds that invest in bonds issued by banks, corporates, govt. bodies including RBI and money market instruments like commercial papers, bank CDs, T-bills etc. A debt fund helps you grow your money better because of tax efficient returns than your traditional choices of bank FDs, PPFs and post office saving schemes.